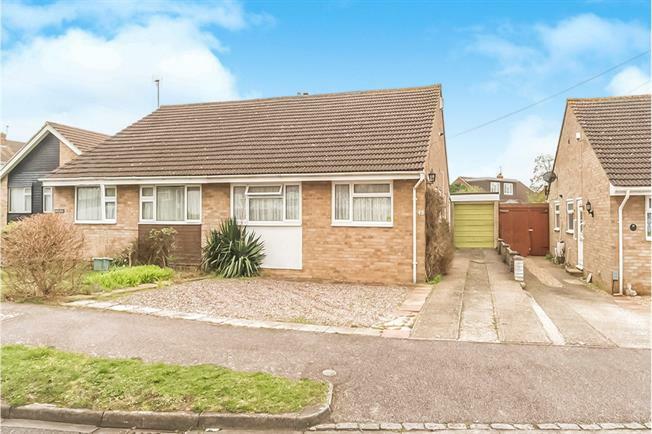 2 Bedroom Semi Detached Bungalow For Sale in Bedford for Asking Price £240,000. A very well presented two bedroom semi detached bungalow located in a cul de sac position within this popular north Bedfordshire village of Clapham. The property benefits from double glazing, gas to radiator heating and a 18ft open plan lounge/diner. There is fitted shower room and fitted kitchen, a 12ft master bedroom and a garage and driveway and is available with the added bonus of no upper chain. Single glazed wood window facing the rear and side. Radiator. Doors to lounge and shower room. UPVC sliding double glazed door, opening onto the garden. Radiator and gas fire. Wooden single glazed door. Double glazed uPVC window facing the side. Roll edge work surface, built-in units, single sink, integrated oven, electric hob. Double glazed uPVC window with obscure glass facing the side. Radiator. Low level WC, double enclosure shower, wash hand basin. Paved patio area leading to mainly laid to lawn. Side access gate to front garden. Driveway. Path to front door. Gravelled area.